I started this map some weeks ago. At the beginning it wasn't supposed to become a playable map but later people told me it could make a great one, so I decided to make it playable. Three days ago I asked Eihrul if there's still enough time to create a map for the next release. He told me I would have to hurry and recommended me to conscript several editors to help me on that map. 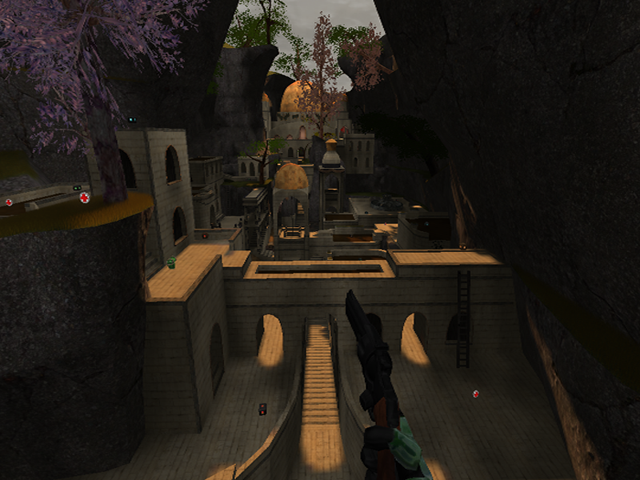 So did I. Hewho, Cooper and even Eihrul worked together with me on this map. The map itself is very huge for normal conditions, huge enough to fit for over 20 players. The recommended gamemodes are Capture the Flag and RegenCapture. Wow, this looks awesome! I really love the mix of styles between the canyon and the ruins. There's only one bug I could find: in a crack next to a staircase on the right side of the map (from where the screenshot is), you can see the sky below the map. Also some indoor lights and less ambient light would be good. The screenshot isn't bad, yet not that great. The hudgun has nothing to do with the map at all, don't include them with a screenshot for maps. The map's license has been stated in the read-me file, while it could also just been given in the content. The theme seems to be - as it's name reveals - a valley. This has been performed quite well. The texturing is done good also, not much to say about that, except it could use some more blendmaps. The geometry isn't as bad as I thought but isn't very efficient at all. Take the tower with those weird signs on the wall. You actually can't see them properly at all, yet they consist out of 62k of wtr! (while the map is 152k of wtr). That's not worth it at all. You could use those triangles way better on other spots than on some inside walls of a tower (replacing the whole wall and putting it back to the stone2 in the nieb folder makes it look way better actually). A screenshot of what I actually meant is given under this point. There are also a lot of edit mistakes within the map, like empty spaces within the mountains and under the map. I've noticed also several geometry failures, which an example under here. The lighting just simply is gross. The sunlight is placed on such way where there isn't any sun shining at all (even there is one on the skybox but on a very different position), neither the brightness feels right. There are several light-entities which contain no light-source and also, there are some light-sources which contain no light-entity (lol?). There are also several spots which should contain some light also. As Greaserpirate stated, put the ambient light down to get some more realistic lighting. Some examples given in the screenshots below. The detailing is fine. Not much time mention about, except certain rooms contain a lot of mapmodels, while other are just completely empty. There could be added more broken stuff around the map. The clipping isn't, but there are certain failures within the map as the screenshot shows below. As for example, using clip instead of noclip. Another good example is clipping a certain area while the next part which is just on the same height isn't clipped at all and fully accessible. The flow is worse as being described. There is just 1 straight (narrow) way to the flag (which makes you bump your head even to some doorway). All buildings are too low actually, as you bump your head constantly to each doorway nearly anywhere within the map. There are several dead ends on the map. Some which are forcing you to turn back or to jump, while they provoke to continue your path forward. This shouldn't be done. A good example of this is the next screenshot (not to mention the noclip-mistake and the geometry failure at the left bottom of the screenshot). Further, there are more paths to the flags but they are vague. I also won't recommend to use ladders within a gameplay map unless it just has to. Why? Because ladders can only occupy 1 player in a certain time from 1 place to another, while jumppads or teleports could do a higher amount without changing the visual scene (a ladder could also but it needs to be unrealistic wide). Another reason is when a players stops moving on the ladder, it can't be considered as a pathway any more because you simply can't move around or over that particular player while still using the ladder. The ammount of playerstart is decent, yet the amount of pickups is way too low. This map seems to be playable for about 24 players, yet about 12 of each pickups has been added. That's way too low for such amount of players. Try to get about 18 of each (keep shells and grenades as highest number and rockets as lowest) or maybe even more. There are no waypoints added also. The positions of the flags are pretty odd. 1 flag has the advantage of being caved in, while the other is just on open ground ready to be taken. This doesn't seems to be fair at all. Also specifying which ammo a base would receive to players isn't a great choice here; especially when a certain base gives only cartridges while you spawn with 40 of that. The position of those could be way better also, as several bases are in sight of each other (which makes them very vurnable of being a direct chain which can't be broken as easily as should and guarantees victory). All playerstarts seems to placed random also, as they contain parameters as "88 1" and "176 2". Doesn't seems to be very professional, neither as being spend much time on it to do actually right. This map doesn't seems to be for deathmatch at all, while it's notified like that. So if I would ask the question: Is this map done? Then I would definitely say no. Why? Because the geometry is still a mess, the lighting needs some serious improvement, the clipping still has mistakes, the flow still could have some fixes, the flags and bases are positioned bad and no waypoints added. So the actually thing which as been done right is the packaging (which I haven't mentioned before) theme and texturing. Don't blame me if I give 3/10 for this. About the lightning, it looks a bit boring, its working but still dont fits correctly in the map. The terrain and the backgrounds works for the map, those are well done (nice terrain). The map is visually good, looks good, but there are details that doesnt need to be there, they can be replaced for more simple details, and also the gameplay can be very frustrating when you dont know the map and you want to run out of a base, i can add more suggestions but i dont have too much time right now ,greetings. Well, the better critics have already had their say, so I'll add some of my own thoughts. I like this map a lot. However, I agree that it is not really good for serious gameplay. I also would like to know why you decided to make all of the stairs into ramps. While it makes the camera less bumpy, it just seems weird. What I like most about this map is that every detail is unique. I like CTF maps that aren't simply mirrored around the center, and despite any unrealistic things, the individuality of each building makes the map great artistically. This would be a place that I would enjoy exploring IRL. some nicer lighting would be nice. I wasn't able to get online the last 2 days so I couldn't do much on the map..
You have no idea how much people actually worked on the map yet not getting any credit. If I would ask credit for every constructive comment I make on maps, then whole quadropolis would be titled after me (don't worry, I won't). Shame on you asking credit for just connecting to some server.